September | 2016 | Enough of this Tomfoolery! The present day obsession with dissecting what members of the British royal family wear is not new. Whilst today there is social media, forums and blogs that are devoted to the clothes worn by the Duchess of Cambridge, the Countess of Wessex and even the Queen herself, interest in the fashions worn by royalty has been around since before the age of the internet and mass media. During the 1950s, Princess Margaret could command enormous press attention for her clothes which as one newspaper breathlessly proclaimed that “what she wears is news”. Although royalty is not expected to be fashionable, the clothes that they wear are highly important. They should be visible enough to the greatest number of people as possible and allow them to stand out from among the crowds. Their clothes should take into account the occasion, the climate and who their audience will be. Accessories are also very important – hats should not obscure the face; bags and sleeves should not get in the way of shaking hands and shoes should be taken into account for the hours of standing and walking. Colours are equally or more so, very crucial as they can send out messages that can have more impact than words. Currently, the Royal Collection Trust is presenting an exhibition of the clothes of Queen Elizabeth II spread across three royal residences to celebrate her 90th birthday. In this blog, we shall be looking at the sartorial choices of her predecessors and how they have made their own mark though their choices in clothing and style. By the 1870s, Queen Victoria’s image as a grieving widow was one that the public had been accustomed to. It was also during this decade that she was beginning to emerge from her seclusion and her look was reflecting the prevailing mourning custom then of the transition from deepest or first mourning towards the second stage – crape by this point was less used and she began to wear dresses in black silk. Although she would time and again return to crape for the deaths of other family members and relations, it was by this point that our enduring image of Queen Victoria began to take shape. Photographs, prints and portraits of her depicted her as a stout woman in a black silk dress or black with touches of white, with her white widow’s cap atop her head and simple jewellery in pearls and diamonds apart from jet. Even for state occasions such as the state opening of Parliament, Queen Victoria refused to don the state crown and robe of state. Instead she continued to wear her widow’s cap and a simple dress in black and white but as a concession to the formality of the occasion would wear a small diamond crown (made for her by Garrard’s in 1870 and now on display at the Tower of London) which was lighter, fitted well atop her widow’s cap and provided both a compromise for the need of something suitably grand for a state occasion and appropriate for mourning. The sash and star of the Order of the Garter was her only concession to colour. The same was true with her official photographs and portraits where again she would be depicted in a black silk dress trimmed with white lace, the small diamond crown atop her widow’s cap, the sash and star of the Order of the Garter across her chest and wearing pearl and diamond jewellery. An official portrait of the Queen by Heinrich von Angeli completed in 1875 depicted her wearing a double strand pearl necklace, pearl earrings, small pearl brooch and a pearl bracelet with a miniature portrait of Prince Albert. As pearls were appropriate for mourning, the symbolism of the jewels she was wearing for this portrait was not lost on the public as pearls symbolised “tears” and spoke of her continuing sadness over the loss of her beloved husband. From the 1880s onwards, Queen Victoria’s dresses were more aligned with the third stage of mourning where ribbons and trimmings in fabrics other than crape were used. Some of her dresses and gowns were trimmed with black beads or embroidered as well as bordered with fine lace. The black of her dresses provided a splendid backdrop for her pearls and diamonds and were suitably grand, presenting a combination of majesty and homely simplicity. Much like her granddaughter in-law the Duchess of York (later Queen Mary), Queen Victoria also patronised British dressmakers, stores and fabrics. Her dressmakers included Sarah Ann Unitt, Elizabeth Gieve and Martha Dudley – women who were well-versed with meeting the needs of the more conservative tastes of older women. Stores where she made regular purchases included Morgan & Co, John Redfern, Jay’s, Debenham & Freebody, Marshall & Snelgrove, Liberty’s, Robinson & Cleaver, Romanes & Patterson as well as local shops at Windsor, the Isle of Wight and Aberdeenshire. If the Queen happened to like something, she would order it in multiples which further entrenched her unchanging image. Towards the last decade of her life, Queen Victoria’s clothes were made with greater practical considerations in mind. Her clothes from this period were fairly distinctive and more or less uniform with variations in trimmings, embroidery and beading. This perhaps stemmed from her dressmaker Mrs Dudley using a master pattern to save time on fittings for which an increasingly infirm and elderly woman might not have much patience. The dresses are made for ease and comfort – requiring minimum to no effort in putting on and taking off while many of the skirts could be raised by use of button and loop to avoid tripping. Bodices were sewn in with pockets to keep a watch attached to a chain, keys and glasses which the Queen began to rely on more as her eyesight began to fade. Queen Alexandra, born Princess Alexandra of Denmark and raised in modest circumstances found herself thrust onto a bigger and grander stage when she married Albert Edward Prince of Wales in 1863. Beautiful and glamorous, the new Princess of Wales was the Princess Diana of her day. From the moment she arrived in Britain, she quickly became popular with the public and following her wedding, the Prince and Princess of Wales became the toast of society, their London home Marlborough House becoming the centre of glittering events: in effect deputising for Queen Victoria who ceased to entertain following the death of Prince Albert. All this was aided and abetted by the new medium of photography and the widespread availability of images of the Princess of Wales meant that her style and clothes could be copied by society ladies and even middle class women. Considered a tad too slim by contemporary standards, Princess Alexandra however proved to be adept at dressing in a manner befitting her new status, accentuating her best features and disguising any flaws thereby setting trends. She popularised high necklines, “dog collar” necklaces or piling several rows of pearls or diamond necklaces in order to cover a scar on her neck and following a bout with rheumatic fever following the birth of her daughter Louise in 1867 that left her with a limp, some women began to copy this as well by wearing mismatched shoes or purchasing a pair of shoes with unequal heels all while carrying a cane or walking stick. This spawned a bizarre trend known as the “Alexandra limp” and was criticised by several quarters of the press and public. People tutted about how ugly it looked and the papers were quite scathing, noting how this trend was part of a long line of “remarkably foolish things have been done in imitation of royalty” as well as cruel for its “caricaturing of human infirmity”. As many other fashion trends, this proved to be a flash in the pan. Princess Alexandra also learned early on that clothes and fashion could be harnessed to send a message. For instance in 1874, her sister the Tsarevna Maria Feodorovna (nee Princess Dagmar) and her husband the Tsarevich Alexander (the future Tsar Alexander III) of Russia made an official visit to Britain. The tsarevna was also a beauty and seen as a fashion icon in her adopted country. The two sisters made public appearances wearing identical clothes which many historians noted was making an underlying political point, that perhaps Britain and Russia did have something in common that could be the basis of a future alliance or understanding between the two countries. This was considered risky with the prevalent mutual antipathy between Britain and Russia especially with regard to the Ottoman Empire and over the border between the Russian empire and India but the public lapped it up: especially as the clothes emphasised their physical resemblance and striking looks. Unlike her mother-in-law Queen Victoria and other members of the British royal family, Alexandra did not see the need to wear exclusively British designs. Her style and taste remained resolutely continental and she relied on Parisian designers such as Doeuillet, Maison Laferrier, Madame Duboc and Worth for many of her clothes. However she did patronise several British companies especially for her daytime clothes. Despite the fact that Paris was the capital of high fashion, London (and the UK in general) did lead the way for smart tailored wear and the likes of Redfern & Sons, Gent and Son (Birmingham), Durrant of Edinburgh, Albert Phillips and John Morgan and Son all had Princess Alexandra as one of their regular customers. The death of Queen Victoria in 1901 set the stage for a new era and paved the way for a much more visible monarch. 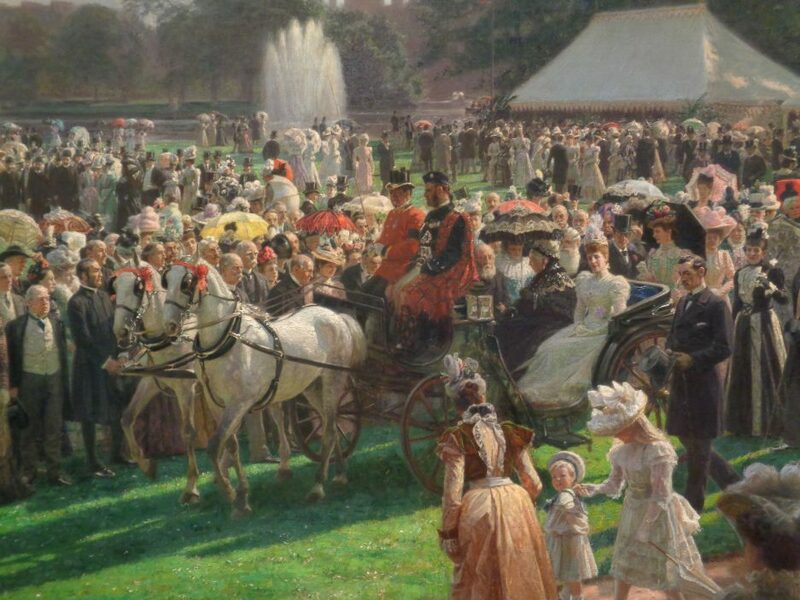 Even as Prince of Wales, King Edward VII was already acutely aware that as the monarch now lacked real political power, he still had an important role to play in the ceremonial life of the nation. He was of the belief that the more people saw their monarch and other members of the royal family, the better it was for both the family and the nation. Clothes were to play an important part in Edward VII’s view of the importance of public ceremonial and duty. Having already successfully weathered the storms in her life and marriage partly due to her what Kate Strasdin called her “astute sartorial decisions” and “ability to dress appropriately for any occasion”, as queen Alexandra’s wardrobe became even more magnificent. Signalling a break from the past, the new King and Queen set the tone for the new reign by attending the State Opening of Parliament with the full pomp and splendour that had not been seen since Prince Albert’s death in 1861. While King Edward VII donned the Imperial State Crown and robe of state, Queen Alexandra was resplendent in her black gown, pearl and diamond jewellery with the sash and star of the Order of the Garter and Queen Victoria’s small diamond crown atop her mourning cap. The effect was a mix of elegance and respect. And wear exactly what she liked it was. Her coronation gown was made in Paris by Morin Blossier, a Parisian dressmaker, from fabric designed by Lady Curzon (vicereine of India) and made in India. Her gown, actually two pieces consisted of a boned bodice and a long skirt, was made up of a cloth of gold and over it a net of Indian embroidery containing the motifs of the British Isles and the Empire. Completing the gown were long hanging sleeves and the standing collar that was trimmed with gold lace. Kate Strasdin has studied Queen Alexandra’s coronation gown, now stored at Kensington Palace’s Royal Ceremonial Dress Collection, and has noted that the design of the fabric was based on the queen’s romanticised view of India, a country she never had an opportunity to visit but that was seen as the “jewel” of the British Empire. Through her choice of the fabric to be made in India, this demonstrated how important the country was in Alexandra’s mind and like her husband she understood the importance of how her appearance at the coronation would have an impact on her husband’s subjects at home and abroad. The only part of her coronation ensemble that was British made was her robe of state made by Marshall and Snelgrove but instead of the traditional violet and crimson, it was in petunia purple; while she eschewed the traditional four arches atop her crown in favour of the continental eight half arches. However there was a limit to how much Queen Alexandra could get away with wearing exactly what she wanted. King Edward VII was a stickler for correct dress especially when it came to official and state occasions and in one instance he took exception to her wearing the sash of the Order of the Garter the wrong way round (the correct way is that its worn over the left shoulder down to the right hip) and asked her to wear it the right way before heading downstairs for an official dinner. And this aura of distance continued into the next reign as royalty took a back seat to fashion. Just as King Edward VII and Queen Alexandra used clothes to foster the idea of a ceremonial monarchy especially against the backdrop of political, economic and social changes, their successors King George V and Queen Mary would use their lack of interest in current fashions to project a wholly different image and a response to greater changes that not even his two predecessors could ever have dreamt of. Bloggers’ note: Although the early years of Victoria’s reign falls before this blog’s specialisation we have decided to review this programme as we believe that the years before 1870 are crucial to understanding the era she lent her name to and how in some ways they affected the twentieth century, even today. In my old workplace, I had a colleague who had a collection of humorous workplace maxims on his desk. One of them read: “aim low, reach your goals and avoid disappointment” and this came to my mind when I read in the papers that ITV had commissioned a drama about Queen Victoria’s early years with the script being written by Daisy Goodwin. Given that she is a historical romance writer known for such novels as My Last Duchess and The Fortune Hunter, I guessed early on that Victoria will dwell more on romance and skirt over the pressing issues that bedeviled the early years of the queen’s reign and which would set in motion the changes that would take place over what turned out to be a long reign. Two episodes down and I have been proven right. The chryon in the opening episode already gives away that this would be long on drama and short on historical accuracy – “1837: The monarchy is in crisis” and sets the stage for the new queen Victoria who had just turned eighteen only a few weeks’ before, pitted against Sir John Conroy, her mother the Duchess of Kent and her uncle the Duke of Cumberland who for reasons of their own all want a regency. Complicating matters is the presence of Lord Melbourne the Prime Minister who Victoria comes to heavily depend on leading to talk among society and sniggerings about “Mrs Melbourne”. Her determination to break free of her past and hang on to Melbourne at all costs as demonstrated by the Lady Flora Hastings scandal and the Bedchamber crisis were touched on lightly as it became clear that the main drama would be the supposed attraction between the Queen and Lord Melbourne. Before telecast, the press had been hyping this as the “new Downton Abbey” and seeing the first two episodes, it’s easy to see why. We are treated to the machinations of some of the servants -particularly the steward Mr Penge (Adrian Schiller), the lady’s maid Miss Jenkins (Eve Myles), her deputy Miss Skerrett (Nell Hudson), Brodie the footman (Tommy Knight) and Francatelli the chef (Ferdinand Kingsley). When Baroness Lehzen (Daniela Holtz) tartly informs Mr Penge that she is now in charge of the household the grumbling between Penge and Jenkins afterwards is reminiscent of Thomas and O’Brien while Skerrett’s mysterious past has parallels with Baxter as do her interactions with Francatelli which has a whiff of Baxter and Molesley about them. The subplots involving the servants are mostly fillers and don’t really add much to the narrative so its baffling why they are included at all unless as a nod to Downton and a belief that viewers want to “identify” with characters and are more likely to do that with downstairs. The acting is mostly hit and miss, Jenna Coleman does strike a fairly good balance with Victoria’s girlishness yet strong will but she does seem to lack the gravitas say demonstrated by Emily Blunt (The Young Victoria) and especially Annette Crosbie (Edward the Seventh). Peter Firth (Duke of Cumberland) and Paul Rhys (Sir John Conroy) are out and out pantomime villains supported by Catherine Fleming (Duchess of Kent) and Alice Orr-Ewing (Lady Flora Hastings). German actress Daniela Holtz makes a brisk Baroness Lehzen but the best actor so far is Rufus Sewell as Lord Melbourne. He might be too young to play the ageing Prime Minister and bon vivant but he brings a depth to Melbourne that goes beyond the sappy script. A scene where he recalls his late wife Lady Caroline is one of his best in my opinion and he conveys grief through gestures with no need for words. The CGI shots of London also looked fairly unconvincing save for the external shots of Buckingham Palace as it existed then with Marble Arch serving its original purpose – as the main entrance to the Palace. It was well done and for me it brought to life how the Palace would have looked just as its’ architect John Nash envisioned it. Over all the script is very uneven, while there are a few flashes of good dialogue such as an exchange between Melbourne and Sir Robert Peel (Nigel Lindsay) where the former gives the latter some advice on how to deal with the Queen (a foreshadowing of Gladstone and Disraeli); others were verging on the hammy and straying into cliché territory. Goodwin also can’t seem to resist beating the viewer over the head – the Duke of Cumberland’s constant mutterings over his father George III’s madness was irritating as is the tug of war between Penge and Lehzen over whether Buckingham Palace should convert to gas lighting. Historical accuracy has also gone out of the window here for the sake of the drama. I can understand why certain liberties are taken for the sake of the narrative but to say that the monarchy was in crisis in 1837 is an exaggeration. The only “crisis” was that the new queen was 18 and totally inexperienced; everyone was looking forward to getting shot of the gouty dissolute old men who had preceded her. Her youth was seen as a breath of fresh air and she was generally preferable to her unpopular surviving uncles. The early years of Victoria’s reign is ripe for exploration of the political, social and economic conditions during that period and yet that was barely touched on. Another niggle that I have is why Lord Melbourne was not wearing court uniform especially in the scenes where it would have been necessary to wear it – during the Coronation and Queen Victoria’s first Privy Council. It’s a little detail but the court uniform would have helped establish Lord Melbourne’s character and his position. I’d like to think that somewhere in this programme is a decent drama and one that can help viewers learn and appreciate more about a pivotal period in British history but I get the feeling that Daisy Goodwin is not exactly the writer who will do that. As for what will follow next, who knows but in the meantime, I will stick to that maxim of aiming low to avoid disappointment.